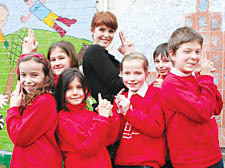 SHE led a school revolution in the recent St Trinian’s film and will soon be dicing with death in the new Bond movie, but actor Gemma Arterton faced her toughest assignment yet on Monday when she was grilled by pupils at a Hampstead school. The 23-year-old star, who beat 1,500 other contenders to the ­coveted Bond girl role, was quizzed by the enquiring minds of year 5 and 6 youngsters at Christchurch Primary School. Thanks to close ties between parents of pupils at the school and the movie industry, the children are taking on the mantle of Hollywood producers. Over the course of the term, they will learn how to use ­camcorders, edit their shots and will work with costume designers from the Golden Compass before premiering the short films they have made at The Everyman Cinema ­later in the year.